Born on April 21st in the historic parish of St. Thomas Jamaica, Donval Lindsay aka Shane Steele began his relationship with music, at the tender age of fourteen he became heavily influenced by the traditional sounds of Reggae. His love of music and devotion to the culture of his birthplace made him seek out new opportunities, he then started to sing and learn how to play the guitar, Shane later migrated to the community of Waterhouse in Kingston JA. At the age of nineteen Shane recorded his first album for Negus Records out of London, England. His first single entitled “Set Not Your Heart On Robbery” was his first song off his debut album. Shane Steele maintain a strong working relationships with a host of talented local producers, all the while practicing his guitar skills to hone his craft even better as time progress. In 1990 Shane Steele signed a recording contract with New Name Music, where he worked on his second album also releasing a single entitled, “Reggae Now”. Shane took a short break for personal reasons in the early 90s but continued to do music on a part time basis, in 1993 he recorded a single called “Bad Sound Producer” for producer Carl Smith . Also in 1997 Shane began to do background vocals for Honey Comb in a Popular Sound competition. That same year he played the guitar with Time and Space band and the High Symbol Band, This gave Shane the opportunity within the music industry to tour Cuba and some other Caribbean islands. Now fully motivated Shane Steele realized that music was now a full time job for him, hence he then applied himself. It didn’t take long for the Reggae scene to embrace this multi-talented artist, Shane then started to do more background vocals for well renowned recording artiste Tony Rebel, this also gave him a greater wealth of experience and exposure extensively touring the United States, Europe and the West Indies. 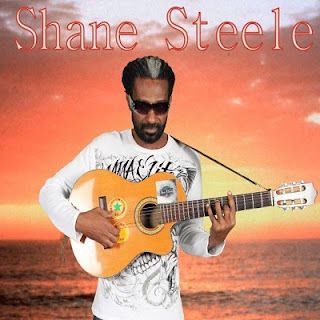 Now at the top of his game and with the success he has received thus far Shane Steel is now ready to step out on his solo carrier ready to take on the world stage as a singer, song writer and guitarist. Confident in his ability Shane started to producing his own album on the Marmalade Production Label. soon after a single was released entitled “This Light of Mine” which given him the opportunity to enter the 2005 Sumfest Red Stripe Big Brake competition. With the quality and content of his music it earned him a spot in the top ten position. Shane Steele currently released his latest single entitled“Woman in Silence” also on the Marmalade Production Label, he is currently getting some good responses form the single. Shane is now a member of the Top Range Band where he plays the Bass guitar and is one of the house band for Rebel Salute Music Festival in St Ann Jamaica. Shane Steele music can be heard as far around the world as Jamaica, Africa, England, Suriname and Canada . As a Singer, Song Writer and Guitarist Shane Steele is destining to shine his light across the world stage.